I thought we’d do something a little fun today. 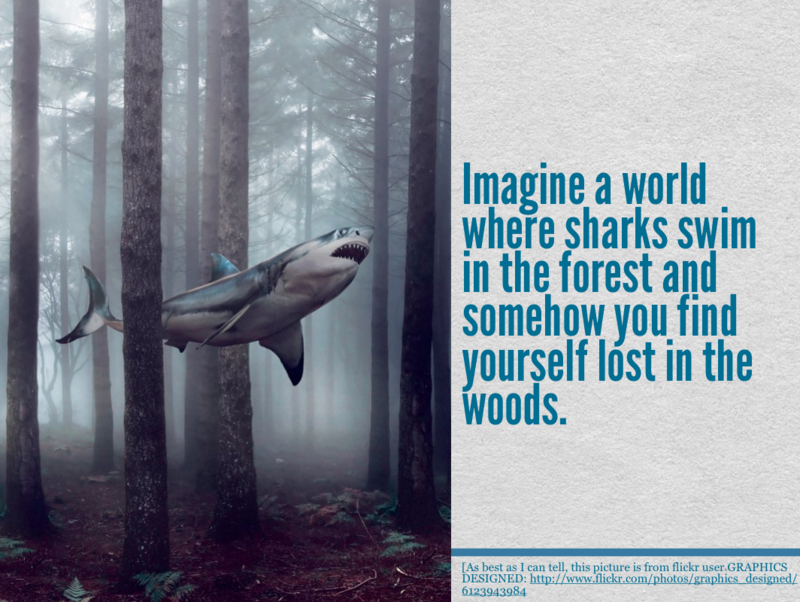 ❤ If you’re really bad with picture prompts and you don’t feel like you can do this, just make sure that you write a story that involves SHARKS! ❤ I can’t wait to see what you guys come up with! Oh, is it that time again? I think so! It’s time for another Blog Challenge! I wanted to switch this one up a bit again… so, instead of me giving you a writing prompt, I want you to make a list. Write down the last five things that you can remember dreaming about. After you’ve done that, use at least three elements from those dreams to make a short story! Doing this, you’re going to kind of delve into your own mind to write a story and practice what a lot of writers do to create new worlds! I can’t wait to see what you all come up with! So, let’s get to it, shall we? Hey, everyone! So, the turnout for my first blog challenge was fantastic! I loved everyone’s responses and am hoping to get the same kind of turn out for this entry in the challenge! Prompt #2: Make a list of five things you’re afraid of happening to you. Then write a story in which one of them happens to your character. That’s right! We’re going a little personal this time. Honestly, it’s a good thing. When writing, being able to pull from personal experience and emotion will make for a fantastic story! I can’t wait to see what everyone comes up with! Remember, you can join in on this challenge at any time ❤ If you do, just link back to my page, and I will make sure to add you to the list of responses when I get mine posted up! Here we are, guys! I asked everyone to do an introduction of themselves for the first step of this blog challenge, and now we’re going to get into the actual juicy bits of it! For starts, we’re going to open with a writing prompt. Writing prompts are very important, in my opinion. They help you to expand your writing capabilities, and they help you to put yourself into a situation that you might not have put yourself in otherwise. Some of my best novel ideas came from a writing prompt that took on a life of its own! Write a story including the following three elements: A stolen ring, fear of spiders, and a sinister stranger. And there we have it! There is our first prompt. When you’re done, make sure to link back to my blog so I can round them all up and post them when I post my own response! I can’t wait to see what you all come up with! Hey everyone! I decided to do a little challenge for my Discord Server, and it’s going to be posted here so you can all participate as well (though, feel free to clicky click here and join the server if you’d like). Anyway, I’ve talked to the members there quite a few times, and we frequently discuss the fact that having a social media presence is important if you plan on publishing. Whether it’s traditionally, in which case showing an agent that you already have a built-in audience is beneficial, or self-publishing… which, of course, having a built-in audience speaks for itself! Social media is important. So, I decided that I would help the members of my group (and any of you who want to participate) by giving blog topics/prompts/etc to write on! So many people have trouble keeping up with a regular blog, so… I thought I’d make it a little easier by giving prompts and challenges for people to complete in order to help them jump-start their very own blog! I’ll be pulling from multiple places: My mind, first of all. That means the occasional Currently, WIP, what are you reading, etc, blog! https://www.creative-writing-now.com/short-story-ideas.html <– I’m also going to grab at least one of these every few days. I love writing prompts, and I think it’s a great way to showcase your talent. https://randomwordgenerator.com/phrase.php <— I am also going to pull from here for more randomized prompts!